Individual Coaching – goal-setting and action-planning, performance improvement, preparation for presentations, and individualized skill development. Appreciative coaching is based on the positive philosophy of Appreciative Inquiry – a powerful and highly success process for change, growth, and development. The core of the process is setting the foundation. This foundation sets the context for the coaching and is best articulated as a goal or outcome that is desired as a result of the coaching process. What motivates you to seek coaching? What outcome do you want from the coaching process? What personal/professional goals have you set aligned with the foundation for coaching? What excites you about coaching? The discovery stage sets the tone for the process. The purpose of this stage is to focus on the individual’s strengths and peak experiences that reflect on past success. 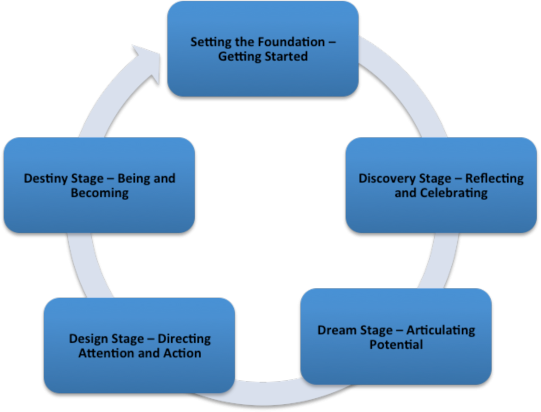 This stage establishes a positive connection and empowering perspective and applies that perspective to the foundation/goal. When do you feel “on top of your game”? When are you at your best? When do you feel at your worst? What positive experiences/successes have you had in the past related to the foundation/goal? When faced with a challenge, how do you behave? When faced with success, how do you behave? What do you want to become more aware of? What skills do you want to build? What practices do you want to establish? What ideas do you want to test/experiment with? In the dream stage, individuals articulate a holistic and meaningful picture of the future. Dreaming gives deliberate attention to positive possibilities and defines desired outcomes in all aspects of being—mental, physical, spiritual, and emotional. Who do you most admire for their skills and abilities related to the foundation/goal? What image do you want others to have of you related to the foundation/goal? Jump into the future (1, 3, or 5, years). What do you see? What are you doing? What are you excited about? If you could communicate with yourself in the future, what questions would you want to ask yourself? The design stage directs an individual’s attention and actions to designing the future he/she most desires. The focus of this stage is to bring mindful focus to the journey in creating a foundation and structure to attain the dream. The process helps individuals establish priorities, identify opportunities and hold themselves accountable for actions. What about your dreams is most important to you? What knowledge, skills and/or abilities do you want to develop? What three big accomplishments would make you feel closer to your dream? Who are your greatest supporters and what do you need from them? What new habits do you want to adopt? What do you want to do that would make you feel proud and capable? The destiny stage involves embracing growth and development fully. This stage is about acting with intention and internalizing learning to reach the goal. It involves self-awareness, determination, and accountability. What seems to be “falling into place”? What were the highlights for you this week/this month related to the foundation/goal? What commitment will you make to yourself this week/this month related to the foundation/goal? When you find yourself in a challenging situation, what do you do? What do you find yourself complaining about and what requests are under them? What are the indicators of your growth and development?